Envoying and intense, Woody Mood offers an assertive tone to the extent of these great sequoia. Bewithching and intense, Woody Mood offers an assertive tone to the extent of these great sequoia. We enter this fragrance as this mysterious heroine approaches the forest. A gap, a hypnotic clarity that invites curiosity: bergamot and ginger illuminate the approach. We progress in matter: Sequoia accord, Black tea, Incense and Jatamansi (Nard of the Himalayas). Until the final spell: styrax, leather and patchouli. 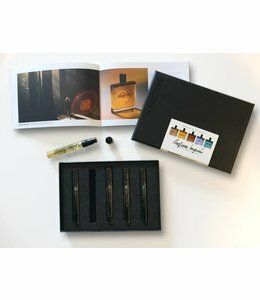 An artist to the core, Bertrand has always created his fragrances using various forms of media such as drawing, painting, and photography. He started his career in perfumery at Lautier Florasynth in Grasse, then Paris. In 2008, he became a freelance perfumer and branched out into artistic fragrances, composing innovative creations. He has been working with the Technicoflor fragrance company since 2014, which he chose for its ethical and environmental commitments. Roger Steffens is a Brooklyn-born photographer, actor, author, editor (he has published several books on Bob Marley), DJ and lecturer who started taking pictures while in a psychological operations unit of the United States military in Vietnam. His images, mostly from the 1960s and ’70s, documenting his unorthodox bohemian life and experiences, have now been catalogued by his Los Angeles based family (daughter Kate, son Devon and wife Mary) under the name the Family Acid. In early 2015, The Family Acid released their first book.